"You are a Knight. Ancient warrior elite. Dreadful backbone of the Hive. You have scarred entire worlds. [...] You fear death. Even as you visit nothingness on your foes, even as you gather tribute from your acolytes, you know that one day your strength will be outmatched. And your centuries of slaughter will end. [...] You betray the sword logic. You compromise the totality of your violence. Why protect your ground when you could take the enemy’s? You need to make your guard into a weapon. There is a knife for you. It is shaped like [no more fear]. Take up the knife. Hide no more. Take your new shape." 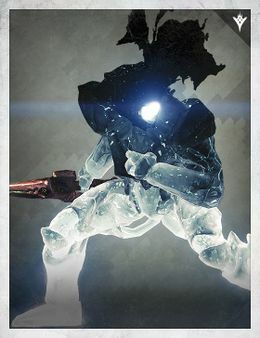 The Taken Knight is a type of Taken Hive which fires explosive Solar jets in a wave to dissuade close combat and force players out of cover, teleports short distances to evade attacks. They are armed with a Void damage Boomer, which, unlike the Hive version, does not suffer from gravitational drop and its projectiles travel much faster, making it harder to evade long-range fire. According to The Sword Logic (also known as "The Killing Logic") the one who kills proves their right to survive over their defeated enemy, and gains power from that act. Upon being Taken the Knight loses the ability to feed their worm and grow that power; instead, all of that goes to the Taker, Oryx, who receives it directly instead of through the hierarchy of Thrall > Acolyte > Knight/Wizard > Ascendant Hive > Hive God. This is both a punishment and an honor, as the Knight is forced to serve against his will, unable to think or act idependently from Oryx's will; on the other hand, it is a sort of apotheosis, the perfection of the Hive way of life: the perfect warrior, the Final True Shape. Taken Knights were formerly named Ripper during production of The Taken King.